Forge Arts has been active as a gallery since 2005 and hosted many exhibitions of work by Lincolnshire artists including ‘Art on the Map’. The refurbishment at the end of 2017 provided further display space which allows us to host regular exhibitions by local artists. 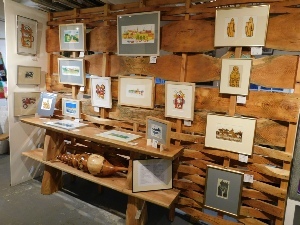 Timber panels designed and made by Mick Burns provide a sympathetic backdrop to the art work and make Forge Arts ‘The gallery with a difference’. Set in the Victorian joiner’s workshop, the gallery retains many of the original features. Some of which have been cleverly turned into display spaces to feature and spotlight 3D work. Exhibitions change every six weeks and we have a programme of events involving local artists throughout the year. Mike Finney, our artist in residence, manages the gallery and has his own studio here. If you would like to exhibit your work at Forge Arts please contact Mike by clicking here. For a small commission Forge Arts will provide you with exhibition space and promote your work both locally and via social media and the internet. Forge Arts is the main outlet of Mike’s paintings, drawing and prints. 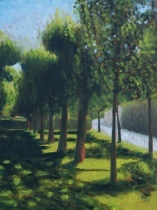 There is always a range of his work available at the gallery. Click here to see more of Mike’s work. You are very welcome to visit Mike’s studio and chat about painting, drawing and printmaking. He is also available to give talks and demonstrations. Please contact him for more information.